Exam results permitting, Tim Hume, who is just finishing year 12 at Mansfield Secondary College, will next year relocate to Canberra to study science at the Australian National University. 2016 therefore promises to be a big year for the 18-year-old. It is unlikely, however, to be quite as big as 2015. 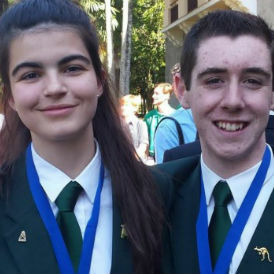 As well as preparing for his VCE while being school joint-captain, he has also recently returned from Brazil where he successfully represented Australia in the prestigious – and extremely tough – International Earth Science Olympiad. Tim earned a silver medal in the Olympiad, which was attended by 91 students drawn from 22 countries. And although he intends to continue to study climate science, this will take second spot behind his first love: physics. Broad figures show that pursuing science and maths education is more difficult for high school students in regional Victoria than for their peers in Melbourne. Tim, who moved to Mansfield from Sydney at the age of six months, acknowledges the statistics. But he says support from parents and teaching staff can overcome the tyranny of distance. Tim’s VCE load is hefty, involving biology, chemistry, physics “and all three maths”. Eschewing a gap year, he will head to ANU after Christmas. It will mark his second visit to the campus. The first came in January this year when he attended a gruelling two-week summer school for prospective Olympiad competitors. Keen science student he may be, but Tim is a long way from the stereotypical loner geek. Encouraged by his parents – who work in retail and tourism – he has developed a wide and healthy range of hobbies and interests. The highlight of his year, however, was his trip to Pocos de Caldas in Brazil in September, for the week-long Olympiad. The four-member team was selected after rigorous testing by an independent organisation called Australian Science Innovations (ASI). It was the first year that Australia had taken part in the Earth Science event, but it certainly won’t be the last. Tim won a silver medal, as did the other Victorian competitor, Sacha Mann from Girton Grammar School in Bendigo. Zoe Thompson from Redlands School in Sydney won gold – the only girl to do so across the Olympiad. The team’s fourth member, Jade Pham from NSW’s James Ruse Agricultural High School, also did well, coming second in one of the Olympiad’s team-based events.